An Indian Muslim scholar who is banned from entering Britain is to address the Oxford Union via satellite link, in a direct challenge to the home secretary, Theresa May. Zakir Naik, who was placed under an exclusion order last summer, has been invited by the debating society to take part in a discussion in two weeks' time on the theme of religious tolerance. The invitation has angered May and could provide an awkward dilemma for the Conservative party. The former shadow home secretary Chris Grayling promised to ban the use of satellite technology to broadcast the views of excluded Islamist preachers based abroad. 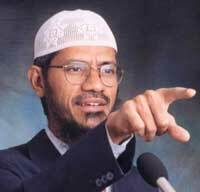 Naik, who founded the global satellite channel Peace TV, was the first Muslim preacher to be banned by the coalition government when he was stopped from entering the country in June. The Mumbai-based television evangelist was invited weeks ago to take part in the debate with academics and students. Thames Valley police have been advising the union on how to conduct the meeting. Naik told the Guardian he was delighted by the invitation. "This gives me the perfect opportunity to show the British people my true views rather than the distorted and false grounds cited by the home secretary," he said. He has argued that he is a moderate and is currently involved in an appeal court action to have the order lifted. Peace TV has a huge following in the Muslim districts of Mumbai, Naik's native city. Naik has been named as the third most popular spiritual guru in India. In a letter highlighting the reasons for his exclusion, May quoted Naik's assertion that "all Muslims should be terrorists" as one example of his unreasonable behaviour. He claims the statement was taken out of context and that he was referring about the right to "terrorise" thieves. Another passage quoted by the home secretary is said to come from a 2006 lecture, in which Naik said of Osama bin Laden: "If he is fighting the enemies of Islam, I am for him." Naik claims the lecture was given in 1998, before the September 11 attacks. Naik, who has also been accused of holding antisemitic and sexist views, claims to be "non-violent and an enemy of extremism". His ban provoked a row in Whitehall over whether it was right to exclude Islamic preachers who pledged to help the government halt the spread of violent ideologies. In October, court papers revealed that Charles Farr, director general of the office for security and counter-terrorism, backed Naik's fight to stay in Britain. One of Farr's senior officials, Sabin Khan, was suspended from duty for criticising the exclusion as a "huge error of judgment". The Oxford Union is regarded as one of the most prestigious debating chambers in the world and was once described by Harold Macmillan as "the last bastion of free speech in the western world". Founded in 1823, it has played host to the likes of US presidents Reagan, Nixon and Carter, the Dalai Lama, Mother Teresa and the Queen. A spokesman for the union said Naik should be allowed to speak because of his influence in the debate on Islamic fundamentalism. "The Oxford Union exists to discuss and debate ideas, even those considered unorthodox or controversial by society at large. Members of the union will be given the opportunity to challenge Dr Naik on any aspect of his views. "Dr Naik will be speaking via video link, rather than appearing in person. We have no desire to challenge Dr Naik's ban on entry to the UK. However, we do wish to give our members the chance to discuss and challenge his views on terrorism and the Home Office's recent decision to ban him," he said. In opposition, David Cameron was highly critical of Labour's failure to ban hardline preachers. After a number of news stories highlighted the way banned preachers were circumventing the law, he and the opposition pledged to stop it. In a speech delivered to a US audience in December 2009, Chris Grayling, the then shadow home secretary, promised to stop banned preachers from circumventing exclusion orders by broadcasting their words by satellite link or video. "We have seen numerous examples of banned preachers propagating their views to British audiences by video or audio link from the countries where they now live. If we are in government, we will take further steps to outlaw such activity – and to prosecute those who organise the propagation of banned ideologies via video and satellite links in public places," he said in a speech, which is still on the party's website. The Conservative MP Patrick Mercer, former chairman of the Commons counter-terrorism committee, called for the government to halt the broadcast. "The coalition government should pursue this with vigour. Naik is a subversive pest and his words not be allowed to reach the vulnerable and the impressionable," he said. The Home Office said: "The government makes no apologies for refusing people access to the UK if we believe they represent a threat to our society. Coming here is a privilege that we refuse to extend to those who seek to subvert our shared values." I am surprised by the narrow view taken when we never fail to mention the West advocates free speech.